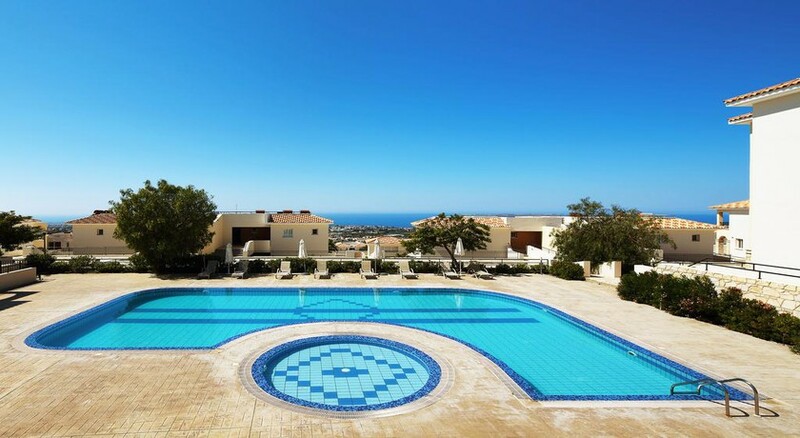 Club St. George’s can be found nestled away in the historic sun-drenched village of Tremithousa just outside the Paphos, a beautiful location to soak in both the sun, local historic sites, fun attractions and of course the beach. Club St. George is an ideal resort for families, couples and lone travellers alike. You can expect your stay here to be pleasant with comfortable, well designed and tastefully decorated rooms. There's a comprehensive range of hotel facilities ensuring your stay is just what you’re looking for, including air-conditioning in every room, indoor and outdoor swimming pools, jacuzzi and easy access to local shopping. Club St. George’s is a self-catering establishment, so every room comes equipped with a kitchen. However, there are a restaurant and bar to be found at the hotel. Children will enjoy the playground the indoor playroom. A wellness centre can also be found along with hot tubs, sauna and massage treatment rooms. Club St. George Resort and can be reached from Paphos International Airport in around 30 minutes. Whilst it’s not right on the doorstep of a golden sand beach, the nearest beach is only 5km away. You’re in the perfect spot to access great shopping and fantastic restaurants catering to a multitude of tastes. Downtown Paphos is under 3 miles away, providing even more options for dining as well as historical attractions. Rooms at Club St. George feature all the modern conveniences you’d expect of a contemporary hotel including air-conditioning, wi-fi, T.V., private bathroom and more. As it is a self-catering establishment you’ll also find a kitchenette with microwave, fridge and tea and coffee making facilities, some also include a washing machine and an oven. 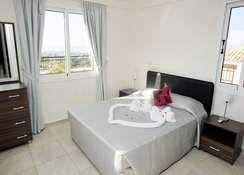 The rooms themselves are light and bright and designed to let in plenty of that Cyprus sun in during the day. Many rooms come with a balcony overlooking the Mediterranean Sea and comfortable and spacious dining areas in the larger family rooms. At Club St. George’s Resort you’ll find a restaurant and bar on-site. There are local shops and a market in the village with which you may make the most of your kitchenette if you choose. However, for more options, you’ll need to venture a little further out. If you do so you’ll hit a great selection. If you’re in the mood for Chinese or Thai then head to Flying Dragon, Indian you’re looking for, Koh-I-Noor has two sites, a takeaway and the main restaurant. There’s also authentic Cypriot and Greek food to be found at Tavernaki Restaurant and The Famagusta Tavern. There’s plenty of relaxation options on offer at Club St. George. Ease your stresses at the wellness centre, relax in either the indoor or outdoor pool, or simply relax at the sauna or in the hot tub. Club St. George Resort also cater to children through the playground and indoor playroom. If you want to explore more of Paphos, why not start with the picturesque village you’ll find yourself in, the old-town feel is charming and a day spent wandering around is a stress-free way to start your holiday. You’ll need a taxi to reach further out attractions but none of which are very far away. A short journey can have you experiencing everything from the excitement of Paphos Waterpark, the history of the Medieval Castle of Paphos or the golden fine sand beaches. Paphos anyway Ill just say for this place a car rental I found is a must as the beach is too far to walk. Resort is clean and accommodation comfortable. The bar area food is good but the all inclusive menu is limited mainly to one choice for each course. A big drawback is the distance from Paphos town some ten kilometers and the main road is down a pretty steep hill around a quarter of a mile away. There is a shuttle bus but it only goes and returns once a day to Paphos port and Coral bay beach. Hiring a car is almost a necessity to get around, which is cheapest and most choice in the port area of town. Evening entertainment is poor. We thought club st George's was a great place to relax- specious apartments with everything you needed-great atmosphere at the bar where staff were excellent and all in we loved our time there. Word of warning though 'if your planning to spend much time in paphos city you are about 40 mins drive away- the hotel has a shuttle run to paphos twice a day. But if you are looking to just relax and take it easy found st George's brilliant and would certainly go back ; though be warned the hotel complex is sort of out in the sticks- but great for our needs. We stayed here all inclusive last summer. After reading mixed reviews we didn’t know what to expect but we’re pleasantly surprised. Yes the location is poor and you would need a car, but if that doesn’t bother you then it’s great. Very good pool area, accommodation is large and clean. Food was ok and didn’t change much daily. For a few days away for peace and quiet then it did the job. Outdated. Rude staff. Awful food. Damp mouldy room. Ended up moving hotels.